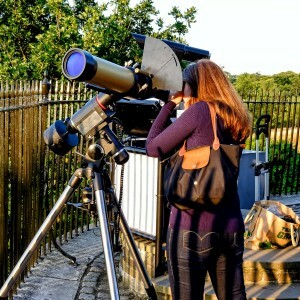 At our last Flamsteed committee meeting in May, Nick Phillips proposed that we set up a series of “members only” solar viewing events at the Royal Observatory Greenwich to take advantage of the equipment that we have available and to promote interest in solar observing amongst the Flamsteed membership. We’ve been running public sessions at the Royal Observatory Greenwich for many years now, but the huge numbers of people that come to these events means that we can’t spend much time with each observer to really explain what they are looking at when viewing the Sun safely through a hydrogen-alpha solar telescope. Nick’s proposal for smaller events aimed at our members was a perfect solution to this. Obviously, we had to plan the sessions for when the ROG was closed, so we planned for some early evening events during the Summer months. Happily the ROG fully supported Nick’s idea and we were all set for our first session on the evening of Tuesday 22 July. Our first problem on arrival was choosing a suitable viewing location from within the Meridian Courtyard. Some fella called Wren had thoughtlessly built a house right in line with our optimum viewing location, so we had to search around the courtyard for a place where we would see the Sun all the way through our session as it started to set over London. We eventually decided on a location right by the fence next to the camera obscura building by Flamsteed House. A beautiful location, as we were looking right over Greenwich Park and London on a glorious summer evening. Things were a little fraught as Nick and I waited for the Sun to clear the corner of the building but, right on cue, it came into our field of view at exactly 6.30pm, the start time for our session. I was a little concerned prior to the session, as the Sun has been extremely quiet in the last week or so. In fact, for the first time in several years, the Sun was completely “spotless” only a few days ago. I needn’t have worried. Though sunspots were in short supply (only a couple of small spots were on display), we were treated to some superb solar prominences. One of these prominences seemed to loop out hundreds of thousands of miles from the surface of the Sun, most certainly the largest prominence that I have ever seen. Around 20 Flamsteed members and their guests came along to the inaugural evening solar viewing session, and we had some fabulous feedback from everyone who attended. An added bonus was that Rupert brought along a telescope with a hydrogen-alpha eyepiece attached, which gave some superb views of the solar surface and prominences. He stationed himself around the back of Flamsteed House, where we managed to find a spot with an uninterrupted view of the Sun as it set over London. All in all, a very successful evening with some great company. It’s always fun to speak to our very knowledgable members at events like these, but also a particular joy to show people something that they had never seen through a telescope before. We will be running 3 more members solar viewing events this summer (weather permitting, of course), so if you’d like to come along, please contact us. Thank you to everyone who attended and made the event such a success. Thanks also to the ROG and the very helpful staff who were on duty to help us out. A particular thanks to Nick Phillips. Without his determination to run a members solar viewing event and his persuasive powers when seeking agreement from the ROG, we would not have been able to run this event.